Story & photos by Dr. Michael Lim The Travelling GourmetTM, all rights reserved. MAGNIFICENT is one of many superlatives to describe this hotel built in the 14th Century that used to be the Palazzo or Palace of the Doge Enrico Dandolo. 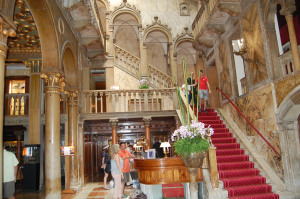 Arguably, Venezia’s finest, most luxurious and most historic hostelry. As you stroll in though the revolving doors you are struck by the grand ambience and the well preserved historic architecture. If only walls could speak what wonderful tales they would tell..If you have seen the hit movie “The Tourist” starring glamourous Angelina Jolie and Johnny Depp, the Hotel Danieli was where they stayed. This entry was posted in Entertainment, Hotels & Resorts, Let them eat Cake.... Bookmark the permalink.